When we talk about manufacturing process, we can’t end our discussion without describing Sheet metal processes. The word “Sheet Metal” is used for metal sheets of varying thickness. In our daily routine we often encountered with sheet metal products. When you see a car the first thing you like its body which is sheet metal product. The metal desk which you used for arrange your books is a sheet metal product. There are many others like file cabinets, air craft body, metal cans, metal doors etc. are made by this process. Sheet metal operation gives many advantages over forging or casting process which makes it a most versatile operation. These products have good strength with light weighted characteristic, versatility in shapes, low cost, fast production rate and many more advantages which make is suitable for every manufacturing industries. 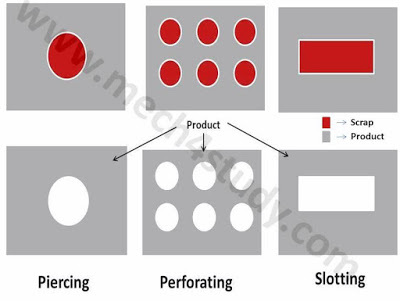 Mainly sheet metal process can be divided into three types. The first one is sheet metal cutting, second one is sheet metal bending or forming and the last one is known as deep drawing. 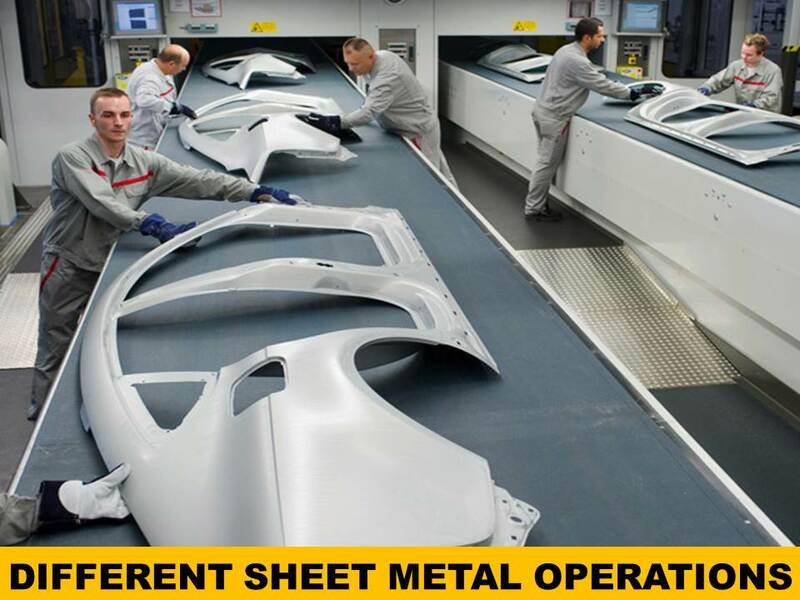 In this article we mainly focus on sheet metal cutting operations and other two we will discuss into upcoming articles. Subscribe our website to get articles directly in your inbox. We will discuss about only cutting operations in this articles. Cutting is an operation by which we can separate a work piece into parts. In this processes, force is applied above ultimate limit of material which cause it to fail. It mainly involves sheering force, hence sometimes it is known as sheet metal shearing processes. To understand the concept of shearing of sheet metal let’s look at the figure given below. The most comment tools are used for sheet metal working are punch and die. Punch is located at upper side of the sheet and die is at lower side. There is a small clearance between punch and die. When the punch applied a downward blow on sheet which is placed over die, it sheer off at the clearance zone due to shearing force. The shearing force, edge finish and other parameters are mainly depends on clearance between punch and die. Sheet metal cutting operation can be further divided into following types. I will suggest you to clearly watch the images and try to understand through it. 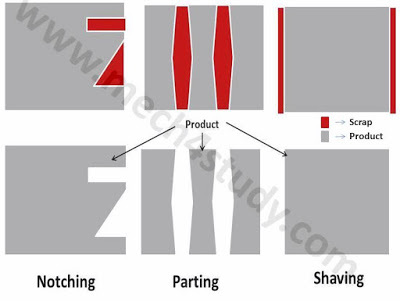 Sheering is a process of converting large sheet into small sheet by cut along a line. It is used to cut sheet into several parts. Mostly is used to cut rectangular parts but any other shape can also be cut. The edges form by cutting perpendicular to the plane of sheet. 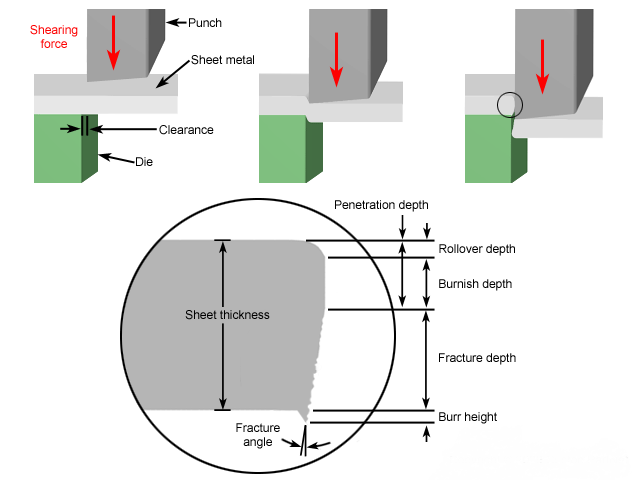 The clearance between punch and die play major role in determining the shape and quality of the sheared edges. Blanking is an operation of removing a piece of metal from a large sheet by punching with a predefine shaped punch. The removed part is called blank and it is the useful part and rest sheet is scrap. This process is used to cut gears, jewelry and complex parts. 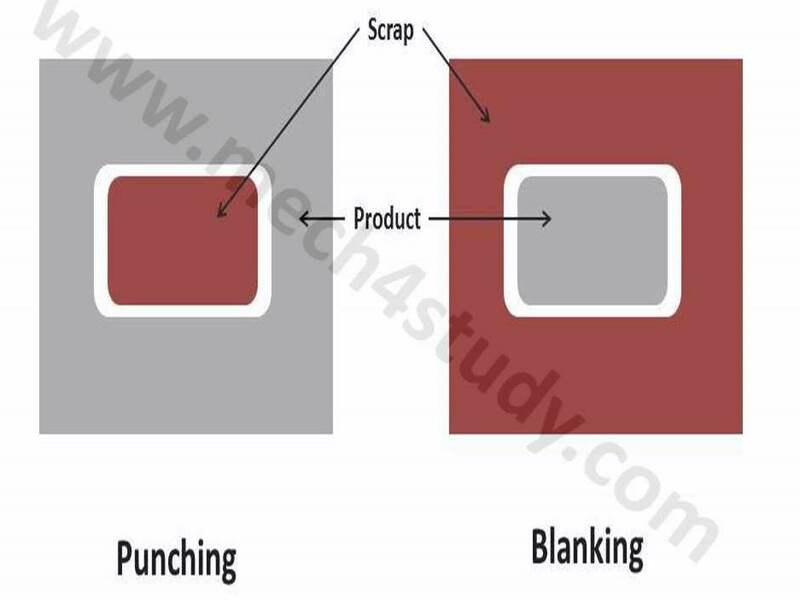 It is similar operation like blanking except, the desire part is sheet and the blank is scrap. This process takes place on punching press. The negative allowance is provided on the punch which gives positive tolerance on sheet. This process is used to produce very smooth and square edges blank. In this process sheet is locked tightly at accurate place. It involves clearances of the order of 0.5 – 10 mm and dimension tolerances are order of 0.025 – 0.05 mm in most cases. It is a punching process in which a cylindrical hole cut from the sheet. More than one holes cut on a sheet is known as perforating. It is an operation of cutting rectangular hole on a sheet. It is a process of removing various shapes on edges. It creates notches at edges, hence named notching. 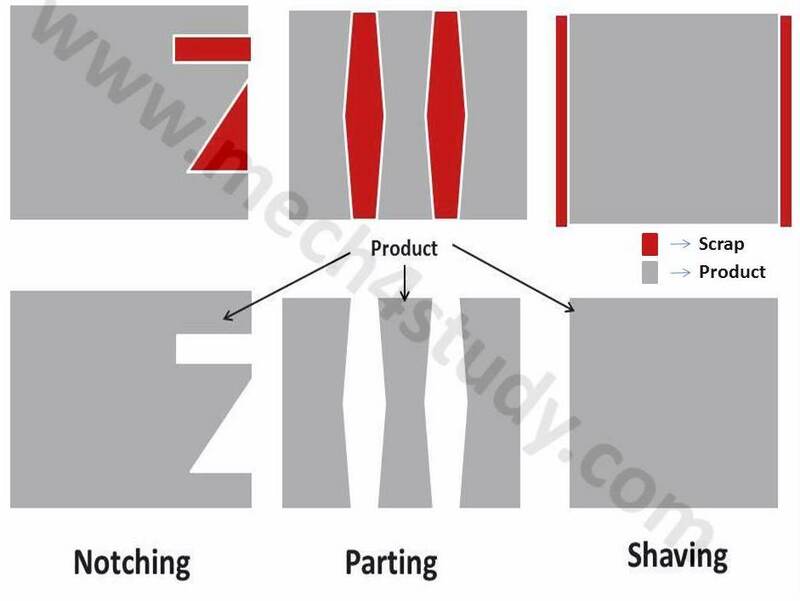 Shaving is a finishing operation in which a minimum layer of metal is removed from edges using punch and die system. It is a shearing operation in which the sheet is converted into two or more piece by removing small blank from the sheet. This is an operation in which punch is formed without removing the blank part. No metal removal takes place. The blank remain attached in bent form. 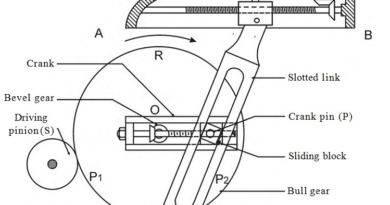 Slitting is a process of cut straight line without removing any material as shown in figure. Trimming general meaning is removing excess material from work piece. In this process metal is removed from edges by using punch and die. These are main Sheet metal operations. If you find anything missing, put it in comment box. If you like this article, don’t forget to share it with your friends. Subscribe our website for more informative articles. Thanks for reading it.